Since 2005, DNS Accountants has been providing various Accountancy Services in Bromley and Beckenham along with a vast range of other expertise. Our Accountants in Bromley are a part of a large network of qualified professionals who are members of professional accounting bodies such as CIMA, ACCA or Alumni from well-accredited universities. We handle a well-established clientele of over 1200 which includes a diverse range of Owner Managed Businesses, Startups, Freelancers and Contractors. More often than not, small businesses refuse to outsource Accounting services and see them as an added expense. DNS aids these businesses in their establishment and growth with our skills and knowledge. We provide them with professional Chartered and Tax Accountants in Bromley and Beckenham to create a more efficient and profitable accounting system. Helps CIS Subcontractors get Faster and Higher tax refunds. The ‘Business Growth System’, developed in the UK, has helped thousands of businesses and industries worldwide to get more customers and increase sales. It is quick and easy to implement and the strategies are efficient and low cost thus increasing sales and profits substantially. At £150 plus VAT, DNS’s services include formation on the company, payroll registration and the setting up of a business bank account. DNS guides businesses through the required legal process of Auto – Enrollment to workplace pension schemes by providing necessary assistance and advice. DNS offers free training on its online accounting portal and after gathering the necessary business information, management accounts are formulated. DNS offers payroll registration FREE as part of its ‘Company Formation Package’. We look after all the registration and documentation with HMRC and take over all existing payroll services like Set-up, processing, pay-slips, tax structure etc. The Registered Office Address (ROA) is the address at which your company is officially, legally, registered upon incorporation and is mandatory for any business. It is displayed on the Public Register of Companies at Companies House and will always be used for official correspondence all UK governing bodies. DNS offers the service of comprehensive preparation of Self Assessment Tax Return for Business owners, Sole traders and Limited companies. We collect all relevant information, file returns, cross check drafts and ensure efficient and timely tax returns. Our Tax Accountants in Bromley provide all necessary tax advice and handle all communication regarding tax returns with HMRC. DNS provides a tax Investigation service which includes Assessment, advice and assistance in all legal documentation and taxation matters with the help of our professional Chartered and Tax Accountants at Bromley and Beckenham. DNS offers a cost effective VAT registration and returns service to assist businesses in the right decision making regarding registration and filing accurate VAT returns and further administration of the same. DNS helps ensure that a client never face a penalty for late submission, inaccuracy, or late payment. DNS helps businesses meet the year- end deadline and ensure that the accounts accurately reflect the business before submission to HMRC and Companies House. Dedicated Team of Professional Year-End Accountants ensures timely preparation and assessment of accounts thus avoiding any possible penalties. DNS offers membership for its clients into IPSE which is the largest association of independent professionals in the EU representing contractors, independent professionals, freelancers, and consultants from every sector of the economy. 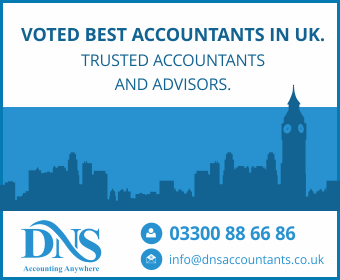 DNS has won the British Accountancy Award in 2013, and was a finalist in 2014 and 2015. Our professional and dedicated Team of Accountants in Bromley and Beckenham ensures timely management and preparation of accounts, taxes, and bookkeeping. In case of any inconvenience or dissatisfaction, our client is eligible for refunds or nonpayment. 97% of Client queries are responded to and 90% of the queries are resolved the same day. At DNS, the key to our success is our attitude and commitment. We aspire to expand our horizons and Accountancy Services to Croydon, London, Wimbledon, Greenwich, Dartford in the near future.